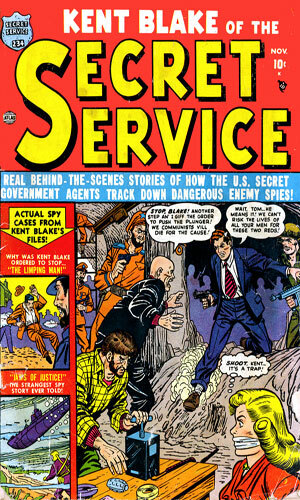 Kent Blake is an agent with the Secret Service. Prior to the Second World War, Blake had been a police officer in New York City and was well on his way to making a name for himself as a man who got results. Shortly after the bombing of Pearl Harbor and the U.S.'s entry into WWII, Kent Blake was drafted. His assigned duties took him to McDill Airfield to train in a bomber squadron. One of his missions resulted in his aircraft being hit and the team he was in parachuting into enemy territory. Captured, he was tortured for information while in a POW campe from which he was finally able to escape. A man he broke out with was killed in the attempt but passed to him a message to be delivered to the man's boss back in Washington. 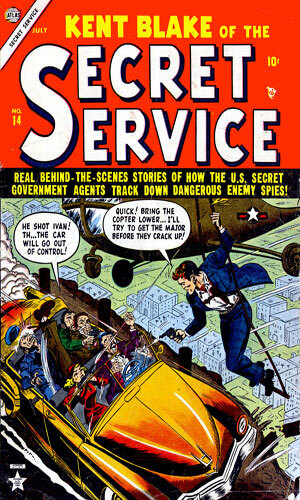 Doing so brought Blake to the attention of a man named Kruger who would see a potential agent in Blake and offered him a job, resulting in his becoming an agent with the Secret Service. More importantly, he was given a job of Special Secret Agent and answered directly to Kruger, head of the agency. 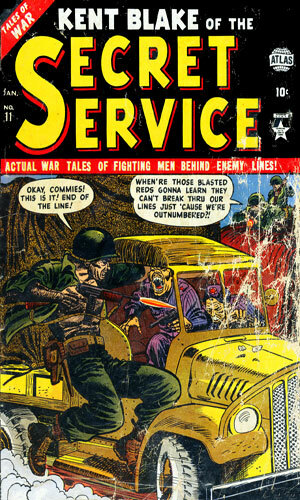 With the end of hostilities, Blake's missions moved from fighting Nazis to combating the increasing threat of Communists in both Europe and Asia. It is in that activity that most of the recorded adventures take place. Blake is single and shows no interest in settling down - certainly the demands of his job would make that impossible and his love of adventure is shown to be too strong to consider anything else. He is likely in his mid 30s during most of the stories about him, based on his having been a cop for a few years prior to 1941, placing his likely birth year around 1918. He has rugged good looks and an athletic build. His hair is brown with a slight wave to it. Before Marvel Comics was Marvel, it was Atlas Comics (before that it was Timely). 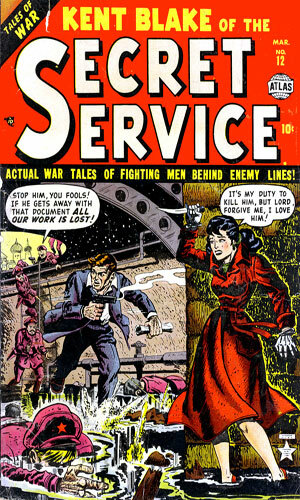 The Kent Blake adventures took place during the Atlas years. Two decades after the switch from Atlas to Marvel and 26 years after the last recorded adventure of Kent Blake, the Amazing Spider-man had an occasion to take on yet again his archenemy, Doctor Octopus. In that storyline, we learn of a punk who kills a secret agent named Kent Blake but made it look like a suicide. Blake's ghost appears to Spidey asking for help clearing his name so his wife could collect his life insurance. The agent was obviously in his late 20s or early 30s so it is unlikely it was the same Kent Blake but having the same name and the same type of profession makes it seem so. Son? Note: Most of the titles for the stories are taken from the pages of the comics. A small number, though, had no title given so I created one and put it inside "" marks. 1st of 3 adventures from Issue #1 - 8 pages - Communists kidnap a US Senator and replace him with a double to cast a No vote on a super-tank bill. He is unmasked by Kent Blake. Story also contains the origin of Blake as told by his boss. 2nd of 3 adventures from Issue #1 - 5 pages - To attain proof the Soviets are maintaining slave labor camps. Kent Blake smuggles himself into such a place in Siberia..
3rd of 3 adventures from Issue #1 - 5 pages - A downed American bomber contains counterfeit plates. Kent Blake lays a trap for the Communist agents out to get them. 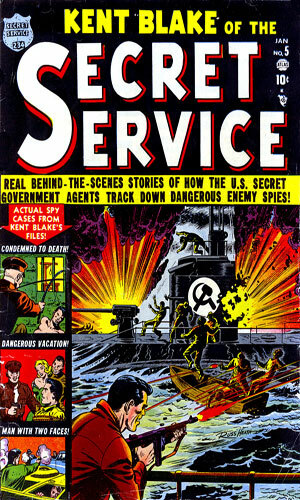 1st of 3 adventures from Issue #2 - 7 pages - In 1951, captured Communist spies are released when a key witness, a powerful politician, recants his ascertains they are spies. Kent Blake wonders what is up. 2nd of 3 adventures from Issue #2 - 5 pages - It is Kent Blake's job to put an end to some American sea traders selling items to China, causing trouble in the current Korean Conflict. 3rd of 3 adventures from Issue #2 - 7 pages - The man suspected of being being a counterfeit ring is behind bars so Kent Blake has to figure out how he is operating things. 1st of 3 adventures from Issue #3 - 7 pages - The Chinese have killed the current Great Lama and replaced him with a double aligned with them. Kent Blake does not fall for it. 2nd of 3 adventures from Issue #3 - 5 pages - A scientist who developed a new tank weapon has been killed. His secretary calls in the Secret Service because she know it was not just a robbery. 3rd of 3 adventures from Issue #3 - 7 pages - Kent Blake must meed with a Chinese general in the Resistance but that means heading deep into Communist China. 1st of 3 adventures from Issue #4 - 7 pages - A man in New York's Records Bureau has sold secret infrastructure plans to the city to communists who are planning a nasty event unless Kent Blake can stop them. 2nd of 3 adventures from Issue #4 - 5 pages - Kent Blake is in Florida with the Coast Guard looking for communist infiltrators. He finds a ship wreck explorer who is not what he claims. 3rd of 3 adventures from Issue #4 - 7 pages - Kent Blake is in Spain to meet with the Ambassador when he learns quickly someone does not want him alive to make the appointment. 1st of 3 adventures from Issue #5 - 7 pages - Communists in Greece are hampering relief work. Kent Blake is sent there to hamper them. 2nd of 3 adventures from Issue #5 - 5 pages - A small Balkan nation is having elections. The current dictator wants to make sure he wins. Kent Blake wants to make sure the vote is fair. 3rd of 3 adventures from Issue #5 - 7 pages - On vacation on Long Island, Kent Blake comes across a bit of espionage happening thanks to hypnosis. 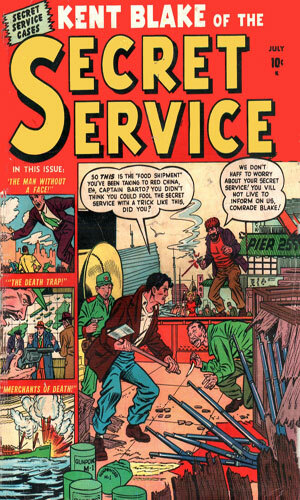 1st of 3 adventures from Issue #6 - 7 pages - It is to New York that Kent Blake is sent to find a communist counterfeiter. 2nd of 3 adventures from Issue #6 - 7 pages - Blake is surprised at the airport by his boss, back in military uniform. He is told that they have both reenlisted to go to Korea. 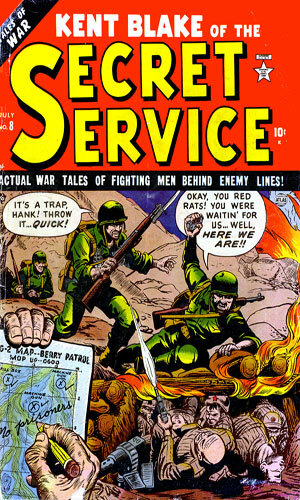 3rd of 3 adventures from Issue #6 - 5 pages - Someone is sending via radio facts on supply runs, causing logistics trouble, Kent Blake suspects a strange USO show. 1st of 3 adventures from Issue #7 - 7 pages - Fighting to help take a mountain nicknamed "Doom", Blake learns its summit is camouflaged and he wants to know why. 2nd of 3 adventures from Issue #7 - 5 pages - The squad he is temporarily with is ambushed and Blake becomes aware that their movements are being betrayed from within. 3rd of 3 adventures from Issue #7 - 7 pages - A nuclear scientist has been kidnapped by the Chinese and Kent Blake must head to the fortress where he is held to get him out. 2nd of 3 adventures from Issue #8 - 7 pages - Kent Blake is ordered to find how the Chinese know so quickly where the Allied forces are. 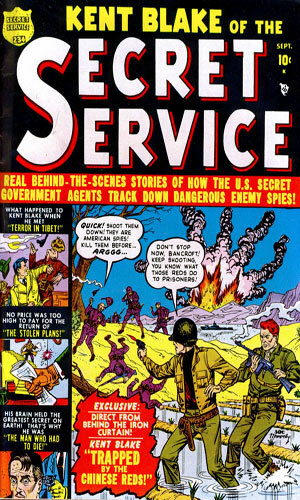 2nd of 3 adventures from Issue #8 - 6 pages - American planes are disappearing and Kent Blake teams up with the Air Force to find out what is happening to them. 3rd of 3 adventures from Issue #8 - 6 pages - The North Koreans are working on a deadly virus and Kent Blake is teamed with a beautiful female agent to destroy it. 1st of 3 adventures from Issue #9 - 7 pages - Peace talks are underway and reporters monitor them. Kent Blake is tasked with monitoring the reporters. 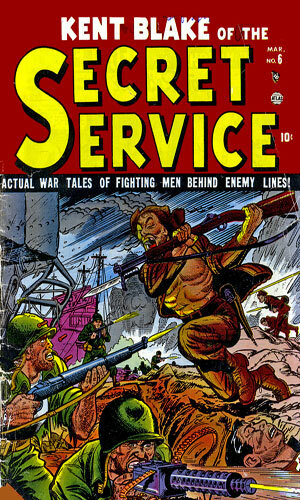 2nd of 3 adventures from Issue #9 - 6 pages - The influx of Chinese soldiers into Korea are hurting the war effort. Kent Blake is ordered to slow them down. 3rd of 3 adventures from Issue #9 - 6 pages - Kent Blake is tasked with taking out a Korean listening post and he is given a green recruit for assistance. 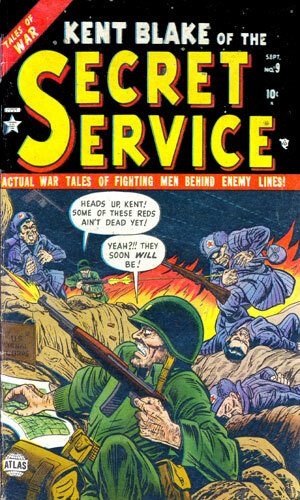 1st of 3 adventures from Issue #10 - 7 pages - American forces are surprise attacked and the man suspected of being a traitor is Kent Blake. 2nd of 3 adventures from Issue #10 - 5 pages - Kent Blake is with a troop of soldiers who take a few enemy soldiers prisoner but getting them back to base for questioning is not easy. 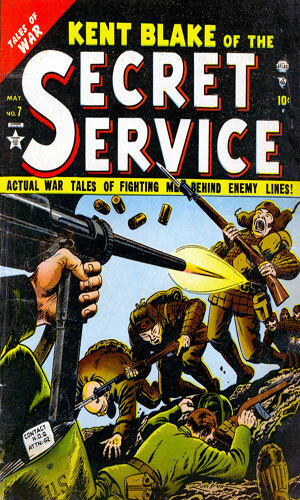 3rd of 3 adventures from Issue #10 - 6 pages - The enemy has a new form of artillery and Kent Blake is ordered to find out about it by heading behind enemy lines. 1st of 3 adventures from Issue #11 - 5 pages - When foul weather prevents reconnaissance planes from flying, Kent Blake is ordered to sneak behind the lines to learn the enemy plans. 2nd of 3 adventures from Issue #11 - 7 pages - The orders are to sneak into fly a helo into enemy territory to recover a MIG pilot recently shot down. 3rd of 3 adventures from Issue #11 - 6 pages - Some arms dealers are providing the Chinese with armaments and Kent Blake is told to find out who they are. 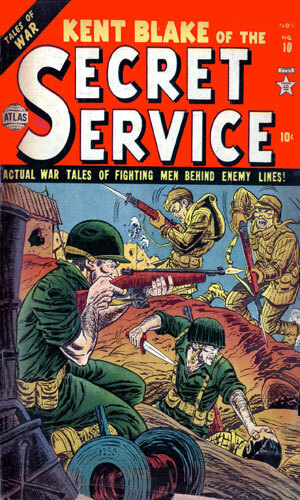 1st of 3 adventures from Issue #12 contains - 7 pages - Chinese soldiers holed up in a cave are preventing American forces from advancing. Kent Blake is sent to find another way into the cave. 2nd of 3 adventures from Issue #12 - 6 pages - The capture of a supply truck by Chinese soldiers only net them a lot of new uniforms but they put them to good use. 3rd of 3 adventures from Issue #12 - 5 pages - At the same time Kent Blake learns of an imminent attack by Chinese soldiers, they learn about him and a hunt is on. 1st of 3 adventures from Issue #13 - 6 pages - Kent Blake is back in Europe, sneaking into Czechoslovakia to pull out a biological warfare scientist the Soviets are holding. 2nd of 3 adventures in Issue #13 - 5 pages - The last members of K Company are heading back to headquarters when HQ learns Chinese forces are nearing their position. Kent Blake is sent to help them get home. 3rd of 3 adventures from Issue #13 - 7 pages - Blake is no longer needed in Korea and is sent to Istanbul to tackle a Soviet spy named The Snake. 1st of 3 adventures from Issue #13 - 7 pages - Myra Tangier, a very dangerous adversary, leaves Kent Blake buried to his neck in the Sahara. 2nd of 3 adventures from Issue #13 - 5 pages - In Florida, Blake is working with the Coast Guard to stop the transfer of vital secrets via underwater dead drops. 3rd of 3 adventures from Issue #13 contains - 6 pages - Diamonds are being used in the latest rocket generator and Blake visits a scientist to learn how. 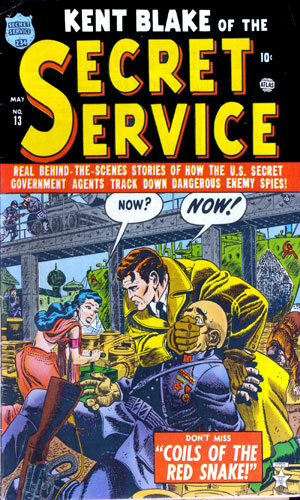 This is the sort of spy comic series I love to sink my teeth into. It has a lot of depth to it and gives the character a lot of room to operate. I learn enough of the character to know I want to know even more and the idea of "leave 'em wanting more" fits. Unlike many series from this decade and most from the previous one, we actually discover quite a bit about the character before he becomes a secret agent and that helps a lot in liking the guy and wanting to follow him. The story writing is darn good. Many of the tales are short so putting in enough data to make it all make sense is tough but it is done story after story and I doff my hat to that kind of skill. 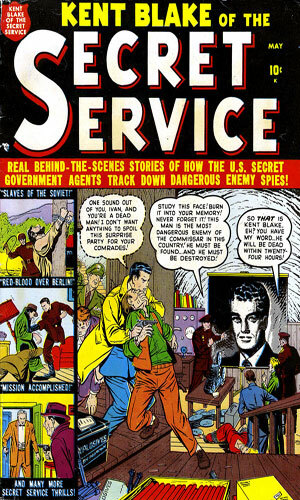 There are not many comic spy series that had me wishing someone would write an actual book about the character(s) but Kent Blake is one I would have readily put money down for.